When our personal smart devices run out of batteries and we forgot to bring chargers, and worse, we are stuck in a place where no power sources, how we could wish our own body movements could charge them up. In a few years’ time, small electronic devices might actually be charged up by electricity generated directly from our bodies. A study led by University at Buffalo and Institute of Semiconductors (IoP) at Chinese Academy of Science (CAS) has developed a small tab that only has to be attached on our skin to generate electricity by converting mechanical energy from bending a finger and other simple movements. “No one likes being tethered to a power outlet or lugging around a portable charger. The human body is an abundant source of energy. We thought: ‘Why not harness it to produce our own power? '” said Qiaoqiang Gan, lead author of the study published online Jan. 31 in the journal Nano Energy. The small tab, which comprises of thin films of gold, is classified as a triboelectric nanogenerator. A nanogenerator is a device that converts mechanical or thermal energy brought by small-scale physical changes into electricity. One of the three types of nanogenerators is the triboelectric type, which generates electricity after the device becomes in frictional contact with other materials. A good example of the triboelectric effect is the static electricity. Most of the triboelectric nanogenerators developed by researchers are either difficult to mass produce (requiring complex lithography) or not cost effective. To address these challenges, the researcher team at UB and CAS came up with a device that is manufactured through a simple process. The triboelectric nanogenerator the group developed consists of a silicon-based polymer called polydimethylsiloxane or PDMS sandwiched by two thin layers of gold. This structure of the tab is designed in such a way that when small physical movements are done by our bodies, a frictional contact occurs between the PDMS and gold layers. For instance, if a finger is bent, one of the gold layers is stretched, and when the finger is released, the stretched gold layer gets crumpled. “This causes electrons to flow back and forth between the gold layers. The more friction, the greater the amount of power is produced,” says Yun Xu, a co-lead author of the study. With dimensions as small as 1.5 centimeters long by 1 centimeter wide, the golden tab can generate a maximum voltage and current of 124 volts and 10 microamps, respectively, and a maximum power density of 0.22 milliwatts per square centimeter. This amount of electricity can simultaneously light up 48 red LED lights, but not enough to quickly recharge a smartphone. 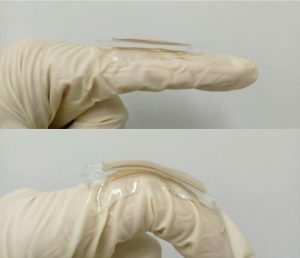 Targeted application of the tab is powering up small and wearable electronic devices, and so future studies by the research team include improving the efficiency and performance of the small tab by using larger pieces of gold, which would mean more electricity when stretched and folded. The team will also be working on creating a portable battery to store the energy generated by the tab.